We’d love your help. Let us know what’s wrong with this preview of Lady of Mazes by Karl Schroeder. Karl Schroeder is one of the new stars of hard SF. His novels, Ventus and Permanence, have established him as a new force in the field. Now he extends his reach into Larry Niven territory, returning to the same distant future in which Ventus was set, but employing a broader canvas. Lady of Mazes the story of Teven Coronal, a ringworld with a huge multiplicity of human civil Karl Schroeder is one of the new stars of hard SF. His novels, Ventus and Permanence, have established him as a new force in the field. Now he extends his reach into Larry Niven territory, returning to the same distant future in which Ventus was set, but employing a broader canvas. Lady of Mazes the story of Teven Coronal, a ringworld with a huge multiplicity of human civilizations. It's the story of what happens when the delicate balance of coexisting worlds is completely destroyed, when the fabric of reality itself is torn. Brilliant but troubled Livia Kodaly is Teven's only hope against invaders both human and superhuman who threaten the fragile ecologies and human diversity. To ask other readers questions about Lady of Mazes, please sign up. How much would one miss reading Lady of Mazes without having read Ventus before? Joe I just finished it without knowing Ventus existed and do not feel like I missed anything. Huge ideas drive this book. Action and character much less so, however, and appear sometimes only incidentally. But the ideas are vast and mind-boggling, and come fast enough to keep any reader wondering if they really know what Karl Schroeder is trying to say, so despite flaws it's still recommended to read. Why was I disappointed? I read the back cover and found out that this book takes place on a Ringworld. Sounds cool, I thought, and I went into the book bringing my version of reality with me. Huge ideas drive this book. Action and character much less so, however, and appear sometimes only incidentally. Why was I disappointed? I read the back cover and found out that this book takes place on a Ringworld. Sounds cool, I thought, and I went into the book bringing my version of reality with me. Big mistake, and the author took the next 360 pages to beat me over the head again and again why my version of reality is not to be projected beyond myself, as it requires my own set of values which may not be shared elsewhere. More than that however, reality and values require a certain technological worldview. With the right technology set, any particular collection of values and sense of reality will be comfortable enough to work, bringing happiness and fulfillment. So, my mistake was hoping that the novel would have "real" descriptions of how cool life might be like on a ringworld. I did get snippets of that, surprisingly brief. There was even one very cool part where the residents drop off their ringworld and head to the next one. Yes, that's correct - there's a whole lineup of these ringworlds, and after calculating that dropping off one sends you directly to the next, the characters embark within the strangest spaceship imaginable - a house, floating/flying in free fall. But then the cool parts ended all too abruptly, and in between was several hundred pages of arcane philosophical arguments, and bizarre post-human virtual reality that made little sense. At least 325 pages of the 360 was a chore for me, bogging down into incomprehensibility. But it's worth it. The author is definitely saying something. After reading, I do know what the "open-source Government" is, and how the "Votes" emerge. And I do have a better understanding of the "Good Book" and how it functions. 1) Set up different manifolds, separate from each other by means of horizons, in which similar groups of people can engage in a common reality. The horizons between them are set up via "tech locks". (Because technology dictates your reality, as the author repeatedly informs, and as I mentioned earlier). 2) Create a homogeneous "narrative" in which there is one reality for everybody, and happiness and fulfillment is ubiquitous. Hide the fact from anyone's awareness that basically everybody is doing the same exact thing over and over again. 3) Let reality be governed by rules in the "Good Book", so that people no longer use their own volition to determine reality, but follow the guidelines to adjust accordingly to the interactions they have with others who are likewise playing roles dictated by the good book. So these are the three options, and the main character Livia Kodaly is trying to save option 1. There are other forces, however, alien and otherwise, that are working for options 2 and 3. Can Livia do things herself? Or if she needs an ally, then from which could she choose? Which foe is truly a foe, and which foe might become an ally? Or... is there a 4th option? 4) Keep the tech locks, and establish a set of manifolds without horizons? By now you're got the point. There's a lot of deep ideas here, and some things seem to take on allegorical significance. But it's hard work, and when the novel bogs down, it stays bogged down for huge stretches, when I found myself rereading to be sure I was understanding what was said. The plot hinges on the tech locks, and the four options, so I spent enough time to think I got the basic idea.... but I'd sure like to have more explanation. It's rare that a prequel is not only better than the original, but also completely stands alone to the point you don't need to have read the other book. Lady of Mazes is one such book. Although set in the universe of Ventus and hundreds of years before, although the antagonist (to use the word loosely) is the same, the main characters and setting are completely different. Livia Kodalay's world, hidden from the rest of humanity to chart its own path, has been invaded and everything she knows is be It's rare that a prequel is not only better than the original, but also completely stands alone to the point you don't need to have read the other book. Lady of Mazes is one such book. Although set in the universe of Ventus and hundreds of years before, although the antagonist (to use the word loosely) is the same, the main characters and setting are completely different. Livia Kodalay's world, hidden from the rest of humanity to chart its own path, has been invaded and everything she knows is being torn apart. Her only hope becomes to seek help among the rest of the human civilization, although she's not even sure if her enemy is from them or not. This is a book filled with ideas, not just about technology but about different ways to live, and what may make our lives meaningful and relevant, about how technology doesn't just define our values, but actually mediates our reality. Just as technology allows us to interact with things, like radio waves, that exist, but wouldn't otherwise affect our lives, become extremely important to us, it can also allow us to edit our senses and make things that are real, even potentially dangerous, not affect our lives at all. Each option is potentially as much an illusion as the other... unless we live naked in a cave, we choose the technology and the illusions it drags along (and in the end, the cave, too, is technology, that mediates our reality by making the weather something that can be occasionally ignored, and therefore not nearly as deadly). One of the things I've noticed about this particular author over and over again is that rarely he includes true villains... in many cases, it's just conflicts between different points of view, of people doing the best they can... and it's much the same here, where even with the entity/group that's suggested as the big bad, you can see why some of the people choose that path, and of the many types of societies, I honestly don't know which I think is the more appealing path... there are aspects of both types that delight and terrify me a little. I've read this book several times, and each time I do, I go through this shift in my point of view, back and forth, not just seeing but agreeing with both sides and being left more than a little uncertain... which is great. I suppose that's expected a little when the main character's greatest strength is explicitly stated, not as skill with a sword or weapon, but the ability to see and empathize with other points of view. What a richly inventive novel this is. Lady of Mazes is most of all about ideas, the concepts coming quickly and piled on top of each other. To describe the plot is really to do the novel an injustice. Well, if I must, I'd say it's a kind of travel narrative in a far future solar system, where virtual reality plays a central role. The protagonist, Livia, sees terrible things happen to her home and world, so sets off to address them. Where does she go? Livia travels between ringworlds. By flung ho What a richly inventive novel this is. Lady of Mazes is most of all about ideas, the concepts coming quickly and piled on top of each other. Where does she go? Livia travels between ringworlds. By flung house. Virtual reality is really central to the plot, which turns on the politics of building, maintaining, and sharing artificial worlds. Which sounds drier than it really is, since Schroeder's dialog keeps discussions thoughtful and fresh. I was surprised by much of the plot, since it shunned cliches and swerved in odd directions. That's a rare treat for today's sf. I'm debating on whether to give this book 2 or 3 stars. Normally I'd plow through something this short and accessibly written in a day or two, but I kept finding myself putting this book down to do something else. I had several issues, but foremost was the fact that for a novel that was billed as "hard sf" on the cover it was remarkably short on science and incredibly long on buzzwords and tropes. You could replace the Artificial Intelligences with Gods or Demons, the 'manifolds' and 'narratives' I'm debating on whether to give this book 2 or 3 stars. Normally I'd plow through something this short and accessibly written in a day or two, but I kept finding myself putting this book down to do something else. I had several issues, but foremost was the fact that for a novel that was billed as "hard sf" on the cover it was remarkably short on science and incredibly long on buzzwords and tropes. You could replace the Artificial Intelligences with Gods or Demons, the 'manifolds' and 'narratives' with astral planes, and nanotechnology with magic and it would quite frankly be a better novel. My second issue is that I found the characters to be uninteresting and two dimensional. Often if an SF novel is short on the nuts and bolts, you will find that the author has focused on the characters and their interactions. That is the case here as well, really, but it didn't work for me. Which brings me back full circle to my first issue, which is that to the author's credit he has created a very interesting world, Solar system, galaxy. Actually I'm not really sure what he created, because sometimes he talks about Earth, Jupiter and Venus as if they're very nearby, and other times they seem like they're on the other side of the galactic cluster. Everything is left up in the air like that. There are literally dozens of amazing locales, concepts and ideas introduced, sketchily explained and then ignored except when necessary to prop up the story. My take: This book would be a MUCH better story if the fluff was trimmed down (there's an awful lot of soul searching, flying houses, unnecessary wooden spacecraft, etc.) and replaced with "nuts and bolts". Exploriation of some of the interesting locales would be a big plus as well. Very good book, but hard to follow at times, and the characters aren't very convincing (except when they are). But the sfnal ideas are very, very cool! Ideas 4.5 stars, characters & flow 3 stars. Overall 3.7 stars. B+/A-. Good far-future speculation. Gets a bit incoherent at the end, and starts out slow. I didn't really get interested until the group from Teven Coronal got out to the Archipelago. * Livia Kodaly, a young woman with an extraordinary past that she wants only to live down, who is called upon to exceed even her own legend in order to save her people." Here's the review that lead me to reread it. I didn't like the book as much as he did. Schroeder is a fairly recent discovery for me. (Why is it that I tend to love Canadian SF authors? Do I have some sort of deep-seated genetic affinity?) I haven't read everything by him yet, but I've liked everything I've read so far. 'Lady of Mazes; is admittedly not my favorite selection by him so far, but I still quite liked it. It reminded me of Elizabeth Bear's Jacob's Ladder books - but better. It took a while for me to get into it. The multi-layered virtual reality these characters live in Schroeder is a fairly recent discovery for me. (Why is it that I tend to love Canadian SF authors? Do I have some sort of deep-seated genetic affinity?) I haven't read everything by him yet, but I've liked everything I've read so far. 'Lady of Mazes; is admittedly not my favorite selection by him so far, but I still quite liked it. It reminded me of Elizabeth Bear's Jacob's Ladder books - but better. A fantastic merging of hard sci-fi and and space opera. The scale is similar to The Eclipse series, Rendezvous with Rama, or an Iain Banks novel. The ideas are terrific. This is essentially a philosophical thought experiment on the implications of important ideas from computer science today in augmented reality and artificial intelligence. It covers in an accessible way topics like redirected walking, nanotechnology, emergent systems, embodied intelligence, and the socio-political analogues of d A fantastic merging of hard sci-fi and and space opera. The scale is similar to The Eclipse series, Rendezvous with Rama, or an Iain Banks novel. The ideas are terrific. This is essentially a philosophical thought experiment on the implications of important ideas from computer science today in augmented reality and artificial intelligence. It covers in an accessible way topics like redirected walking, nanotechnology, emergent systems, embodied intelligence, and the socio-political analogues of digital systems. He's also careful to distinguish machine learning (pattern matching) computer behaviour from conscious artificial intelligence, and muses on the nature of intentionality and consciousness. As an expert in many of those technologies, I found everything extremely well thought out and consistent. Until the (view spoiler)[literal! (hide spoiler)] deus ex machina ending chapters, the technologies described are all currently envisioned by science. The ones that collectively create inscape are potentially within our grasp in a rudimentary way in the next decade. It was fascinating to see an intelligent exploration this deep and full of new perspectives. The first few chapters in particular follow the natural conclusion of how AR + AI [plus a bit of highly speculative nanotech] will change human communication. It at first seems fantastical, but consider how cell phones, social media, and texting have transformed social interactions. Where once we had relatively naive, serial face-to-face conversations there are now a sophisticated set of parallel facades and maneuvers...altering reality and perception and aided by machine learning, this could indeed become almost incomprehensible micro-politics and fragmented realities. On the negative side, the writing is sometimes as opaque as that of William Gibson or Bruce Sterling because Schroeder holds back crucial details for understanding the basics of what is even happening for about half the book. I almost put it down in frustration; I'm glad I persevered, but think this was a poor structural choice on the author's and editor's part. The characters also have as little emotion or interest as Isaac Asimov's humans. That is, this is a book of plot and high ideas, and if you're looking for the appeal of a traditional novel, you won't find it here. At its core, this is a more exciting, modern update of Sophie's World. The following (hidden in a spoiler tag in case you don't want to read it!) is the explanation that I wish Schroeder had included early in the book. Him holding this information back didn't yield any great revelation or desire to re-read the early chapters for me. The characters on the Tevan coronal (an artificial ring world near Jupiter) each experience a different view of the world, which they call their manifold. Inscape is the system that produces these different views, which are projected through implants behind their ears. The characters' perceptions of reality are based partly on objective reality ("crippleview") and partly based on inscape. This means that some of the objects, including Livia's sword, the aircars, some clothing, some furniture, and most of the landscape, are really there. Some other parts are just projections, and projections can remove real objects from the view...including other people who might be in the same physical space but be seeing it completely differently. So that people don't accidentally hit each other, sit on chairs that aren't there, or walk into walls, the AI system of inscape manipulates the projections to steer people around. There are also nanotech bots ("angels") that can move people or protect them from accidental harm...you might be in a view where you think you fell asleep in your own bed, even though you had walked someplace else. So, the bots will carry you home while you're sleeping. In the extreme, your bedroom might be the same as someone else's, but you can't see each other and are kept from bumping into each other, so you won't know it. It is a little vague in the book how children enter into this system. They are born only seeing objective reality and some time around puberty their implants activate or are surgically inserted. How you could live in a world where you see stuff your parents don't and vice versa makes little sense to me. I think the construct of inscape and manifolds was the philosophical ground and we're not supposed to poke too deeply at the MacGuffins needed to get there, which is unfortunate. I say objective reality a lot where I should probably say something like "consensus physical reality"; one of the points of the book is of course that your view of reality is always mediated, and there is not necessarily any objective reality even without all of this technology. Nanotech, for those few who might have missed it, is a rapidly developing technology which could make it possible to create absolutely anything by manipulating matter on the molecular level with the help of robotic assemblers, or nanobots, so small as to be invisible. Nanotech is often touted (as, of course, prior technologies have been as well) as potentially bringing a final end to all scarcity, and bestowing upon us lives of endless leisure. "Computing will be integrated into our clothing: no more palmtops and laptops, and going to a Web site will mean going to a shared virtual reality environment. Around 2030, we should be able to flood our brains with nanobots that can be turned off and on and which would function as "experience beamers" allowing us to experience the full range of other people's sensory experiences and if we find ordinary experience too boring, we will have access to archives where more interesting experiences are stored." Bailey is quoting Ray Kurzweil. More on him later, but there you have it. 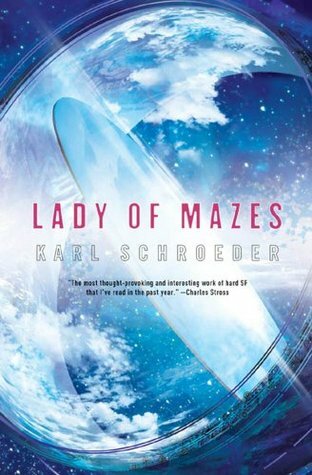 Toronto-based Karl Schroeder's third novel, Lady of Mazes need not take place off-world in the far future. The technology it describes is coming soon to a theatre near you. Like, next week. Bailey's quote more or less describes the environment of Lady of Mazes, except that the venue is an AI-built ringworld near Jupiter, called Teven Coronal. Schroeder foresees a future in which entire realities—"manifolds"—inhabit the same physical space, and where there is little delineation remaining between the experience of the real and the experience of the virtual. The cultures of each manifold are kept discrete from one another by tech locks, the implications of which give the book its philosophical underpinning. The book's heroine, Livia Kodaly, is a diplomat between these virtual worlds. Livia discovers that first Raven, and then the other manifiolds, are being invaded by a mysterious something, perhaps an AI called 3340, which breaks down the barriers between worlds in a bid to create a monoculture. Inscape, a nanotech extrapolation of the Internet, has replaced reality to the extent that few ever experience the real world, and never for extended periods of time. Due to a systems crash that took place during their childhood, Livia and her best friend Aaron have some experience of the real world, and hence a bit of backbone. Most of the survivors of the localized crash eventually died or lost hope, unable to understand that a severe thunderstorm is a fact of nature and that no food or water means just that. Because they were able to learn this lesson, Livia and Aaron are somewhat less feeble than those around them and take it upon themselves, along with Qiingi, to leave their ringworld in a flying house (which I want), to go to the neighbouring Archipelago and endeavour to discover the nature of the invasion and whether or not it can be stopped. During their adventures they learn many things, including that in the Archipelago an inscape monoculture subjugates (or is that cares for?) all; Teven Coronal's suppressed history; and the true nature of 3340. They meet a transhumanist, a god, someone called the Government, and some votes, who are a terrifically clever idea. They do save Teven, but it and they are irrevocably changed now that they are privy to the nature of the world outside their petri-dish reality, which, along with many other things, the makers of their world have kept from them: the price of knowledge is innocence lost. Bill Joy reminded us, in his famous Wired article "Why The Future Doesn"t Need Us," that Thoreau said, "We do not ride on the railroad; it rides upon us." Joy wrote his warning after a meeting with author Ray Kurzweil in Tahoe in 1998. I've been to Tahoe, but just for the downhill skiing. I wish I'd been the proverbial fly on the wall at the bar that day, because in a way, Lady Of Mazes is a child of that meeting. Schroeder is keenly aware that we are living through a historical moment in which human lives are increasingly controlled by pervasive technological systems. To his great credit, he questions the inevitability of the railroad riding us. Is technological progress a priori a good thing? Lady of Mazes's impressive achievement is that it takes on this mostly unexamined tenet, not just of hard SF but of post-Enlightenment Western (read global) civilization. In Qiingi's words, all technologies reflect the values of their designers. Even a culture with little or no technology has chosen: such an environment reflects the values of the citizenry, or at least those with power. Schroeder's carefully considered solution to this problem, to ensure that we ride the railroad and it does not ride us (I'm constantly amazed by how many people I know who are ridden by their cell phones) is the aforementioned tech locks. I found the questions they raise slightly unexamined, although in general Schroeder's setting is well-realized. Do the citizenry, beyond Livia and Aaron and Lucius, never question the founders? There is on Teven little individual power beyond choosing to live in the manifold or submanifiold most to one's liking. This is not the same as the much greater power of the founders or designers: to themselves create worlds amongst which the masses may pick and choose. As well, the ostensibly natural world is in fact created and maintained by nanobots. But if they're so small you can't see them, it's as if they aren't there, right? Still, Schroeder's society is seductive, and, in his version, ends up infecting the galaxy, as most people, once they've heard of them, agree the tech locks are what they want. In a lit class, sometimes the question comes up about who to "blame" when a text is not understandable. Sometimes, this is due to poor writing. However, other times, it is user error, and it is this case that brings me to this book. I want to say I "got" the big ideas in the book: there's worlds stacked on top of worlds, virtual instances of a person that interact with the world, demigod AI things and an AI-run government, space travel... on their own, these concepts make sense. However, when joi In a lit class, sometimes the question comes up about who to "blame" when a text is not understandable. Sometimes, this is due to poor writing. However, other times, it is user error, and it is this case that brings me to this book. I want to say I "got" the big ideas in the book: there's worlds stacked on top of worlds, virtual instances of a person that interact with the world, demigod AI things and an AI-run government, space travel... on their own, these concepts make sense. However, when joined together, it was a bit more than my brain could handle. I think, though, that it got better further in, or at least I was more familiar with the ideas being pushed together. That and actual plotting and action. Read about 20%... loved the world building - the idea of individual intertwined realities - but the style , the pace and the Roman "flavor" were a major turn off. Hay un detalle en Facebook que hace que la gente se sienta poderosa. Cuando no queremos saber nada mas de alguien, simplemente lo borramos. Ese poder hace creer a muchos que esa persona en realidad desaparece. El poder sobre la vida y la muerte...virtual, a la distancia de un click. Como si con eso anularamos una existencia solo por el hecho de que no "encaja" con nosotros. En cierto sentido lo apartamos de "nuestro" mundo, aunque el siga vivito y coleando por alli. Ahora imaginense que eso se tr Hay un detalle en Facebook que hace que la gente se sienta poderosa. Cuando no queremos saber nada mas de alguien, simplemente lo borramos. Ese poder hace creer a muchos que esa persona en realidad desaparece. El poder sobre la vida y la muerte...virtual, a la distancia de un click. Como si con eso anularamos una existencia solo por el hecho de que no "encaja" con nosotros. En cierto sentido lo apartamos de "nuestro" mundo, aunque el siga vivito y coleando por alli. Ahora imaginense que eso se traslada a todo el entorno, que vivimos sumergidos en una realidad aumentada donde alrededor nuestro pueden haber miles de personas, pero no las vemos porque hemos elegido no verlas, y pertenecemos a un "colector" (terminologia del libro) donde solo estamos con quienes comparten nuestra vision del mundo. Y ese mundo ha sido creado de acuerdo a esa visión: una tribu sin acceso a tecnologia con animales parlantes, una sociedad "correcta" donde hay muchos encuentros sociales y gente con "apellido", un inmenso oceano, un panorama de dibujos animados...Y nada puede alterar el hecho de que si en nuestro mundo no queremos ver aviones, estos no apareceran por ningun lado. Quienes unicamente pueden cruzar esas barreras son gente sin convicciones fijas, que son una especie de mensajeros o embajadores entre mundos. Esa es la premisa de la Corona Teven, un mundo anillo cerca de Jupiter, donde millones de personas viven conectados al intrinseco, una red virtual que modela toda la realidad. Esas personas se mueven fisicamente por paisajes creados de acuerdo a sus colectores, e incluso pueden enviar simulaciones para mantener conversaciones en las que se aburririan en persona, y luego pueden bajarla para ver que se perdieron. Un dia esas barreras que separan a estos mundos comienzan a caerse, y es alli donde "La Señora de los Laberintos" empieza y la identidad de quien esta rompiendo esas fronteras en nombre de la libertad se transforma en el McGuffin de esta novela derrite cerebros. En el buen sentido. Aqui hay una densidad de ideas por pagina que deja en calzones a muchos otros escritores de ciencia ficcion, pero tiene una agenda clara en cuanto a la intencion de analizar la condicion humana en medio de un universo donde estamos siendo manejados como marionetas por poderes muy superiores. Y traza una linea directa con el desmedido uso de la tecnologia y sus consecuencias a futuro, con si una vida apacible, pero falsa, tiene algun sentido y el determinismo o el libre albedrio. Sobre lo que la libertad significa para el ser humano...o ya que estamos, que es ser humano. This is a really cool book that explores what societies built around virtual reality might evolve into. When you finally get used to the one society and how it works (and all the lingo, like animas and manifolds and tech locks, etc. ), then you're on another planet which has an even more advanced version of this virtual reality. It's awesome. Interestingly, transhumanism was deemed off limits, but Jupiter's culture is starting to explore the idea. So I loved the ideas, but I just couldn't stay im This is a really cool book that explores what societies built around virtual reality might evolve into. When you finally get used to the one society and how it works (and all the lingo, like animas and manifolds and tech locks, etc. ), then you're on another planet which has an even more advanced version of this virtual reality. It's awesome. Interestingly, transhumanism was deemed off limits, but Jupiter's culture is starting to explore the idea. So I loved the ideas, but I just couldn't stay immersed in this book. I had to fight to keep reading in the beginning, with the steep learning curve. Then I was a little bored because there wasn't much happening that was definite until about 25% of the way through. Just vague hints of things going wrong. For those who are not science fiction fans, this book is not just science fiction, it is hard sf. This means, in theory, that the ideas, concepts and scenarios described have a greater preponderance in the novel than the characters and their "psychological development". That said, I add that the novel, honoring the subgenre, is "hard" to enter to, so I imagine that several readers will abandon it after the first pages. What happens is that the author decided to start with a total immersion in the world of his creation, without providing further explanations or context, and using words of his own creation to name things that obviously doesn't exist yet. I won't talk about the action or the plot, because I think the important thing in the book is the exposure of a society completely built on virtual reality, where contact with "real" reality (sorry for the redundancy) can become fatal. Does it sound unreal? for nothing, maybe when this book was written, but now, with the arrival of the Internet of things and IA more and more powerful, the fiction of this book is already seen as an extrapolation of the current software development. In a way, this is a novel that talks about the famous technological singularity, but from another perspective. The philosophical themes that emerge from all this are also interesting, in fact I read that the novel can be qualified as speculative realism, which is a movement of contemporary philosophy. To finish and not make it longer, I absolutely recommend this book, a pity that is the only one of Schroeder in Spanish so far. It's a pity too that he has not been very successful in the Spanish-American fandom. I confess that I bought it on sale and even still with doubts because the author did not sound me at all. The translation basically fine, although a more attentive corrector would have eliminated several errors that make the reading stumble. Para los que no son fans de la ciencia ficción, este libro no sólo es de ciencia ficción, es cf dura. Eso significa, en teoría, que las ideas, conceptos y escenarios descritos tienen una mayor preponderancia en la novela que los personajes y su "desarrollo sicológico". Dicho esto añado que la novela, haciendo honor al subgénero, es "dura" para entrar a ella, por lo que imagino que varios la abandonarán luego de las primeras páginas. Pasa que el autor decidió hacer de arranque una inmersión total en el mundo de su creación, sin brindar mayores explicaciones ni contexto, y usando "palabros" de su propia creación para nombrar cosas que -obviamente- aún no existen. Y bueno, el desarrollo de la novela ocurre principalmente en un anillo orbital cerca de Júpiter, pero si esperan algo como Mundo anillo de Niven vayan cambiando de expectativas, la megaestructura permea las distintas culturas que alberga, pero no es el fin en si de la narración, esta se enfoca en las AI que rigen las culturas del anillo y el anillo mismo. Todas estas culturas se encuentran en un estado de economía post-escasez, es decir, en ellas los bienes, servicios e información son universalmente accesibles por lo que nadie tiene que trabajar o pagar para conseguirlos. No les hablaré sobre la acción o la trama, por que me parece que lo importante del libro es la exposición de una sociedad totalmente construida sobre realidad virtual, donde el contacto con la realidad "real" (valga la redundancia) puede llegar a ser fatal. ¿Suena irreal? para nada, si cuando se escribió este libro quizás si, ahora, con la llegada del Internet de las cosas e IA cada vez más potentes la ficción de este libro se ve ya como una extrapolación del desarrollo informático actual. En cierta manera esta es una novela en la que se habla de la famosa singularidad tecnológica, pero desde otro enfoque. Los temas filosóficos que se desprenden de todo esto también son interesantes, de hecho leí que la novela puede ser calificada como de realismo especulativo, que es un movimiento de la filosofía contemporánea. Stopped reading around 1/4th in. I do like the concept -- a post-scarcity future where people spend all their time creating meaning for their lives by choosing exactly what world they want to live in, and who they want to spend it with. Technology allows each person to weave exactly the reality they want, and to block out the parts they don't like. This leads to people coming together to create entirely new cultures, with intricate histories and power relations -- all 100% voluntarily. The variou Stopped reading around 1/4th in. I do like the concept -- a post-scarcity future where people spend all their time creating meaning for their lives by choosing exactly what world they want to live in, and who they want to spend it with. Technology allows each person to weave exactly the reality they want, and to block out the parts they don't like. This leads to people coming together to create entirely new cultures, with intricate histories and power relations -- all 100% voluntarily. The various cultures ("realms") can physically exist right next each to other, but their members won't notice each other unless they try. Members can leave, enter and create cultures at will. Cultures can even wage wars upon each other, as long as everyone participates voluntarily (I'm not sure if anyone actually dies in these wars or not). It's a very attractive, and not entirely impossible, future, and many important ethical questions can, and are, explored. I think, however, the setting loses some power by being closer to fantasy to science fiction. The way the "technology" is supposed to work doesn't always make sense, and seems tailored to create a certain atmosphere, or keep the story going, rather than to be realistic. As another reviewer pointed out, it might as well be magic. But a lot of the time, the ethical implications do depend on the details; and when the details don't make sense, the narrative stops being convincing. This book begins with a good character and huge ideas. Livia Kodaly is an extremely social young woman with a deep connection to home -- except home is a virtual reality and her social group is an always-on group of AI that behave exactly like (and can be replaced by) her closest friends and family. The narrative takes you on an insanely epic, thought-provoking ride that feels like traveling through concepts and universes that are astounding in their imagination and exciting in their thorough an This book begins with a good character and huge ideas. Livia Kodaly is an extremely social young woman with a deep connection to home -- except home is a virtual reality and her social group is an always-on group of AI that behave exactly like (and can be replaced by) her closest friends and family. The narrative takes you on an insanely epic, thought-provoking ride that feels like traveling through concepts and universes that are astounding in their imagination and exciting in their thorough and compelling development. By the end of it all it's bursting with mad science: humans, posthumans, and AI angels, open source government, gods, and the freedom to choose technologies defined by our values. But the ideas are all in pursuit of a focused thematic argument that makes Lady of Mazes hard to put down and impossible to stop thinking about. The world was interesting, but the characters felt shallow or one dimensional. The plot didn't really feel like the characters had agency but instead like they were just reacting. The full implications of the world outside the home planet didn't seem to be realized--lots of interesting ideas, but sometimes it seemed like the reality wasn't thought through. For instance, if everyone is always in a virtual reality, why are they wearing clothing in the non-virtual? How is their basic hygiene handle The world was interesting, but the characters felt shallow or one dimensional. The plot didn't really feel like the characters had agency but instead like they were just reacting. A book to make you think. I enjoyed the absence of infodumps, and the gradual introductions of technologies and viewpoints. The plot zips along (sometimes a little too smoothly perhaps), but the core ideas underlying the novel are great, addressing interesting philosophical questions without getting lost in them. Hidden gem. Really good, really fascinating... yet I can't love a book that took 100+ pages to become comprehensible. Hard sci fi. Slow to come into focus, slow to gather around what it's about. Some fine images and moments, some dreary and turgid ones. I suspect if it was ten percent more comprehensible, it would be half as interesting. lovely but jard to pin down story. well written though sometimes slightly too in love with its own philosophy lectures. still some interesting points made about the future of humanity and its relation to technology, and the nature of reality. I enjoyed the extreme forward leap in time and the way different societies and politics were framed. Maybe the best in the series by Schroeder. His ideas are the best part of the book. Drenched in sci-fi and philosophy. At the start it seemed good but not great and then it kinda dribbled a little about a quarter of the way in. Somehow picked up, got really good then awesome. Livia Kodaly lives on a ringworld called Teven Coronal somewhere in the vicinity of Jupiter and, like everybody else on Teven, neither knows nor cares about the wider solar system. This all changes when outsiders come into her world in preparation for an invasion that could change the face of the entire solar system. This book is a prequel to Ventus, although there is almost no overlap between them, this showing the birth of the rogue AI 3340 that was the focus of Ventus. The book aims, like its Livia Kodaly lives on a ringworld called Teven Coronal somewhere in the vicinity of Jupiter and, like everybody else on Teven, neither knows nor cares about the wider solar system. This all changes when outsiders come into her world in preparation for an invasion that could change the face of the entire solar system. This book is a prequel to Ventus, although there is almost no overlap between them, this showing the birth of the rogue AI 3340 that was the focus of Ventus. The book aims, like its predecessor, to cover huge themes of science fiction, philosophy and sociology in its pages. The protagonist, Livia, lives in Westerhaven, which isn't so much a country, but a philosophy (called a 'manifold'), where people of a similar mindset can gather and live together. Westerhaven is metropolitan and engages with high technology, but right under their noses is Raven, which eschews all this technology in favour of a communion with nature and spirit animals and totems. Not metaphorical totems, but enabled by the same technology that enables the animas and 'societies' of Westerhaven. A combination of augmented/virtual reality, nanotech and neural implants ensure that residents of Westerhaven and Raven could walk past each other and never see each other. These differing worldviews are enforced by 'tech locks' that prevent technology that lives outside of the worldview from working within that manifold. This is a fascinating idea, and Schroeder explores it to the full, before taking his protagonists outside the shifting worldviews of Teven to the wider solar system, where they encounter yet more differing philosophies on what it means to live and be human, as they search for allies to help them fight back against the invaders who want to collapse the manifolds and make the inhabitants of Teven see a single view of 'reality'. That is really what this book is about, for me anyway. The nature of reality, and how it shifts depending on the values of the viewer. The manifolds and AR/VR of "inscape" just take that to the nth degree. As Schroeder says in one of the essays about the book on his website, we already inhabit different manifolds when we visit from the city to the country, or even different regions of a city (my own manifold, for example, is probably very different from someone living in The Gorbals). The technology described in Lady of Mazes just takes this to one logical conclusion. And it's a view that I loved reading about. I loved the ideas that it covered and the way that so different worldviews lived together peacefully on Teven and the clash that occurred upon exposure to the wider solar system. The idea that civilisation was now so complex that humans just can't cope with it any more, and the Government has become a distributed AI, with a 'vote' (basically a new node in the Government AI) compiled and brought into existence to represent not just serious political ideas, once they gain traction amongst the population, but also fashions, pet lovers, Shakespeare and almost everything else. I don't really know what to think about this one. On the one hand, it's an example of that rarer breed of sci-fi novels that genuinely engages serious philosophical issues in a groundbreaking way. The world of Lady of Mazes is one in which technology has advanced to the point that it enables a kind of fractured postmodern world in which people with different values and interests can inhabit the same spaces but experience radically different versions of reality, where even the (apparent) laws of p I don't really know what to think about this one. On the one hand, it's an example of that rarer breed of sci-fi novels that genuinely engages serious philosophical issues in a groundbreaking way. The world of Lady of Mazes is one in which technology has advanced to the point that it enables a kind of fractured postmodern world in which people with different values and interests can inhabit the same spaces but experience radically different versions of reality, where even the (apparent) laws of physics in different 'manifolds' are subject to the forms of life of those living within. Certain societies see the world in a particular way, and the world literally changes to fit their perspective. This makes for a very interesting read - the plot is very concerned with the insularity that this world enables, and whether (and exactly how) the reality that we live in ought to be subject to our taste. So far so good. On the other hand, it's so damnably frustrating to read. To begin with, the writing is stylistically mediocre. Most of it is reasonable, but there are long sections that read like little more than lists of events, as if the author wasn't interested in those bits of the story and just wanted to get them over with as quickly as possible and move the plot along. Secondly, it's not really clear where the reader's sympathies are supposed to lie and why. I like books with moral complexity, but there's a difference between stories that pit the reader's values against one another and stories where it's not clear exactly what values the characters share (or fail to share) with the reader and how what they're fighting for relates to that. I spent a big part of the book thinking that the main character was fighting for the wrong cause, hoping she'd have a big change of heart towards the climax. The world she's fighting for seems like a solipsistic nightmare to me, only overshadowed by an even bigger nightmare that shows up somewhere in the middle. Though there are twists, that change of heart never really comes and by the end it seems clear that the author expected the reader to sympathize with her all along. Honestly, none of the various factions in the book make a huge amount of sense to me, but in the end, if I had to pick a side it'd probably be that of the mysterious '3340' - i.e. the faction most straightforwardly portrayed as villainous throughout! A lot of the way the book works is based on this absurd notion of a completed science - that there'd be a point after which we'd have discovered everything worth discovering, and there would be nothing left for humans to do but decide how to go on living their lives. So most of the conflict in the book is about what sort of constraints we want in the artificial leisure worlds we humans inevitably build for ourselves. There are posthuman characters in the mix, but they're mostly in the background, concerned with keeping the humans from transcending the various quaint lifestyles they've built for themselves. It's somewhat frustrating that the main voice for rising above the various self-imposed human conditions (at least in a way that isn't escaping into pure solipcism) is mostly treated as a bad guy, and it's not clear how genuine that party is about their professed beliefs. This came out in 2005, and I described it then as "The-Future-as-Livejournal". (If I'd been hipper I would have said "Friendster"; younger, "Facebook".) Pick your social network, the principle still applies. The people of Teven Coronal can filter their realities: select friends and family and scenery and technology, and live the lives that they choose. Then evil invaders start knocking down the walls. The Archipelago, the civilization beyond Teven's horizons, has picked up a bit more resonance in the past seven years. There, the same world-filtering technology serves a different purpose: it gives people's lives meaning. You are steered towards people you can care about, careers that fit your talents, causes and projects that will satisfy your soul. And if you don't like the way the narratives run your life? There's a narrative for that too! Your struggle against the system will be gratifyingly effective! As far as you can tell. You could describe *that* as an Internet dating service run mad, but the better analogy is personalized search, right? Google *is* my view of reality, to a large extent, and if it decides to show me what I need to become (Google's idea of) happy... I sure wasn't looking at Google with such suspicion in 2005. If Schroeder was, he gets a very large gold star. Futurism aside, how does _Lady of Mazes_ do as a book? Eh, it's okay. The setup is good, but the plot gets murky in the latter half, and the parts that come clear feel contrived. It's perhaps an inevitable flaw: the point is that nonhuman / superhuman intelligences run everything, so why should their plans be comprehensible? Half the time they're opaque scenery, enforcing rigid rules for no obvious reason but to make the setting work. The other half, they talk and act like human characters; then the sense of awe falters and gives us only petty scheming in return. One can easily see sketches of the Virga series here. Teven is the (relatively) low-tech enclave in a vast post-human civilization. The question of living in a universe of "artificial nature" arises; so does the question of extracting meaning from life in a post-scarcity (or post-physical) reality. At the same time, the character writing (while vivid) is clumsier and less subtle than in the Virga books. I might say the same for the plotting, but then I thought Virga wound up as rather a plot-mess too. Well, if nothing else, Schroeder is learning to keep a story moving for more pages at a time. Livia Kodaly lives in a ring world on the edge of the solar system in a far future in which 'reality' consists of a virtual reality that is superimposed on the physical world. The physics are a little sketchy, but that's beside the point; the conceit takes the notion that for each of us, our sense of reality is socially and culturally constructed, and makes it true on the level of the senses, not just on the level of mind. Livia's world comes under attack by a force that wants everyone to share Livia Kodaly lives in a ring world on the edge of the solar system in a far future in which 'reality' consists of a virtual reality that is superimposed on the physical world. The physics are a little sketchy, but that's beside the point; the conceit takes the notion that for each of us, our sense of reality is socially and culturally constructed, and makes it true on the level of the senses, not just on the level of mind. Livia's world comes under attack by a force that wants everyone to share the same reality; she and a few others escape and go looking for a way to fight back. The various conflicts that drive the plot are built around competing answers to a set of philosophical questions: is it better to be content or free? In a post-Singularity universe - that is, after the development of beings transcendently greater than human beings - how can humans meaningfully exercise autonomy? If you voluntarily carry out assigned functions as part of a larger institution whose motives or methods you do not understand, have you sacrificed your own independent worth? These are mostly interesting questions. The story fudges on the ending - in fact, I couldn't see how the story's ending was even possible given the logic of the setting constructed through the rest of the book - but apart from that, the philosophic tensions are handled nicely. I thought of Diaspora when I began reading this book, and whether I liked it or not the thought kept popping up, drawing parallels despite the obvious differences. I found it rather ironic that the humans inhabiting a world claiming that all science was "done", finished, were closer to our present selves than any of the Konishi citizens, still working away in the truth mines. It seems hard to believe that the anecliptics' interventions would have made all such changes impossible (even acknowledg I thought of Diaspora when I began reading this book, and whether I liked it or not the thought kept popping up, drawing parallels despite the obvious differences. I found it rather ironic that the humans inhabiting a world claiming that all science was "done", finished, were closer to our present selves than any of the Konishi citizens, still working away in the truth mines. It seems hard to believe that the anecliptics' interventions would have made all such changes impossible (even acknowledging that uploaded humans in the polises would have more freedom than inscape could provide), which is another ironic thought, considering how preoccupied this novel seems to be with the idea of change. And so to my dismay, in spite of all the ideas and the fancy technology, this turned out to be a fantasy book at its heart, not science fiction. This by itself should not be counted as a flaw, though in my mind it seemed like a wasted opportunity on many counts. I would have loved if it scrapped the story completely and delivered 500 pages exploring its world, the ideas behind manifolds, the way of life in Archipelago. The characters also could have redeemed the book, but for the life of me I could not make myself believe in or care for any of them. Even at the very start, we have to be told to feel for the people in the breaking manifolds, but never get to feel with them, since the invasion begins while the confusing terminology of the world is still being introduced, our experience being constrained to the point of view of someone who already claims to feel like an outsider. There is potential here, but it never connects. I really enjoyed this book . The story starts off on the vast ringworld of Teven Coronal . located in the Lethe Nebula, an enigmatic region of space beyond Jupiter. We meet the Hero of the story Livia Kodaly, a young musician and singer of Westerhaven. Westerhaven ia a manifold each manifold has a culture unto itself, with a unique history, mythology and technology. The manifolds are enabled by programmable matter and neural implants that give access to the virtual realities of "ins cape," where I really enjoyed this book . The story starts off on the vast ringworld of Teven Coronal . located in the Lethe Nebula, an enigmatic region of space beyond Jupiter. We meet the Hero of the story Livia Kodaly, a young musician and singer of Westerhaven. Westerhaven ia a manifold each manifold has a culture unto itself, with a unique history, mythology and technology. The manifolds are enabled by programmable matter and neural implants that give access to the virtual realities of "ins cape," where human minds interface with AIs. Livia enticed into Raven by an adventurous older friend, Lucius Xavier, to investigate rumors of "Impossibles"—anomalies that somehow escape the censorship of the tech locks. Raven, follow a more insular eschewing overt technology in favor of an existence ostensibly closer to nature, not blinding themselves to the advanced technology . When Livia is in Raven she meets a young man named Qiingi. They witness the appearance of strangers who claim to be the mythical ancestors of Raven's people. The "ancestors" Start to attack Teven Coronal . As the people of Teven Coronal are losing the war . Livia, her best friend, Aaron,and Qiingi, flee to space ,hoping to find help. Instead, they find the Archipelago. Based on an inscape without tech locks. The three are soon drawn in to the Byzantine politics of the Archipelago. And also find out about " The Good Book "
I enjoy the relationship between Livia, Aaron,and Qiingi. There a good amount of conflict between the three of them , and some romance too . But what is really interesting about this book is the roll of the " Government and the Gods in the story . The way Livia learns to deal with them and finding faith in herself and her friend Qiingi . If you like well written SfiFi , You really should pick up this book . This review has been hidden because it contains spoilers. To view it, click here. Amazing what you can get read while you wait for an airplane. I guess I've read too much of the great hard-AI soft-AI argument to be surprised by much, as the great secret that the protagonists couldn't see for much of the book was clearly a Chinese Room from the moment it was introduced. They were so oblivious to the obvious nature of the Chinese Room that I basically assumed that they all knew what it was too and just weren't bringing it up. It would also be a bit disingenuous to complain about Amazing what you can get read while you wait for an airplane. I guess I've read too much of the great hard-AI soft-AI argument to be surprised by much, as the great secret that the protagonists couldn't see for much of the book was clearly a Chinese Room from the moment it was introduced. They were so oblivious to the obvious nature of the Chinese Room that I basically assumed that they all knew what it was too and just weren't bringing it up. It would also be a bit disingenuous to complain about a deus ex machina, as that is basically the point of any book struggling with transcendence. So, complaints aside, I did enjoy it. The tech locks seem just as enabling as the author portrays them to be and the people of Archipelago are right to be excited about them. As such they make a great MacGuffin for the last part of the book. The one issue that hinted at within the story and manages to get glossed over even while being a major plot point (or two) is security. The tech locks really only work in a system that is fundamentally secure and the author waves his hands and we are expected to believe that they are. It took me a while to get into this book, mostly because I only had a few minutes each day that I could devote to reading, so it was difficult to understand what was going on just because I would forget what had gone before. But the central concept of the book was very interesting, and unlike a lot of SF concept books, the writing was done well enough, avoiding most of the stilted prose and long explications on the technology that some 'ideas' SF falls into. The central idea is that humanity has It took me a while to get into this book, mostly because I only had a few minutes each day that I could devote to reading, so it was difficult to understand what was going on just because I would forget what had gone before. But the central concept of the book was very interesting, and unlike a lot of SF concept books, the writing was done well enough, avoiding most of the stilted prose and long explications on the technology that some 'ideas' SF falls into. The central idea is that humanity has taken the interconnectedness of the internet, merged it with virtual reality, and created whole universes where people can live in a world of their own choosing (created by VR) that overlaps with the physical world. The problem of course arises when some people born into this kind of world can no longer distinguish the physical from the virtual. As such, the book makes some interesting observations about the divisions between our minds and our bodies, something that is increasingly creeping into robotics and artificial intelligence discourses as well.